254 pages | 112 B/W Illus. High quality meshes play a key role in many applications based on digital modeling and simulation. The finite element method is a paragon for such an approach and it is well known that quality meshes can significantly improve computational efficiency and solution accuracy of this method. Therefore, a lot of effort has been put in methods for improving mesh quality. These range from simple geometric approaches, like Laplacian smoothing, with a high computational efficiency but possible low resulting mesh quality, to global optimization-based methods, resulting in an excellent mesh quality at the cost of an increased computational and implementational complexity. The geometric element transformation method (GETMe) aims to fill the gap between these two approaches. It is based on geometric mesh element transformations, which iteratively transform polygonal and polyhedral elements into their regular counterparts or into elements with a prescribed shape. GETMe combines a Laplacian smoothing-like computational efficiency with a global optimization-like effectiveness. The method is straightforward to implement and its variants can also be used to improve tangled and anisotropic meshes. This book describes the mathematical theory of geometric element transformations as foundation for mesh smoothing. It gives a thorough introduction to GETMe-based mesh smoothing and its algorithms providing a framework to focus on effectively improving key mesh quality aspects. It addresses the improvement of planar, surface, volumetric, mixed, isotropic, and anisotropic meshes and addresses aspects of combining mesh smoothing with topological mesh modification. The advantages of GETMe-based mesh smoothing are demonstrated by the example of various numerical tests. These include smoothing of real world meshes from engineering applications as well as smoothing of synthetic meshes for demonstrating key aspects of GETMe-based mesh improvement. Results are compared with those of other smoothing methods in terms of runtime behavior, mesh quality, and resulting finite element solution efficiency and accuracy. • Helps to improve finite element mesh quality by applying geometry-driven mesh smoothing approaches. 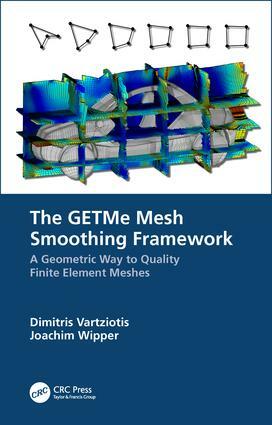 • Supports the reader in understanding and implementing GETMe-based mesh smoothing. • Discusses aspects and properties of GETMe smoothing variants and thus provides guidance for choosing the appropriate mesh improvement algorithm. • Addresses smoothing of various mesh types: planar, surface, volumetric, isotropic, anisotropic, non-mixed, and mixed. • Provides and analyzes geometric element transformations for polygonal and polyhedral elements with regular and non-regular limits. • Includes a broad range of numerical examples and compares results with those of other smoothing methods. Introduction. Elements and Meshes. The Finite Element Method. Mesh Improvement. Regularizing Element Transformations. The GETMe Smoothing Framework. Numerical examples. Extending the GETMe Framework. References. Index. companies. His research focuses on scientific technology and theoretical Mathematics. (zbMATH) and the American Mathematical Society (AMS).